Ever thought about making a trip out to Southern California? Well this should help you make that little push. Experience one of Southern California’s greatest treasures, Huntington Beach. It is the “Surf City” of America and just experiencing this glimpse of it should make you want to take a trip. 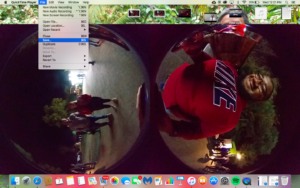 Alaina Kwan filmed and edited this 360 video. 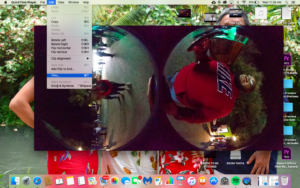 About two weeks ago I came across a tool, while I was editing my 360 video, that I believe could be helpful for anyone who creates VR videos. It is called the “trim tool,” and it can be found on Mac and PC software. The trim tool allows anyone with raw footage to cut the scenes they want to use in their final video before inputting it into Adobe Premiere. This approach can help make the editing process go faster, and this is how you use it. 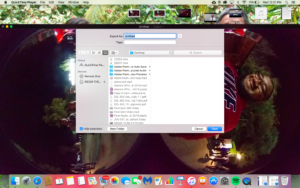 First, pull up a piece of raw footage that you want to use. Watch the full clip a few times before deciding where to make the cut. Then, after you figure out which part of the clip you want to use, go to the edit tab at the top left corner of your desktop or laptop. Then, move your mouse over the tab in order for it to view all the options it provides. Then, if you look towards the bottom of all the options, you will find an option called “trim,” and select it. Then, after you select the tool, it should take you back to your raw clip. However, the timeline should now be highlighted. The highlighted timeline will enable you to cut your clip by dragging both ends of the timeline to the desired location of your clip. Then, once you drag both ends of the timeline to where you want to cut your clip, it should look like the clip you want stand out in color while the rest of video looks like it faded out. From there you can cut the clip, but if you are not sure about the cut you made you are able to watch the cut clip by pressing play. Pressing play at this stage will allow you to play the clip you are trying to cut and start it from where you dragged the timeline. This will allow you to be sure of your cut before actually cutting it. Then, when you feel sure of your cut, you can go ahead and press the “trim” button so the tool can officially cut the video. Then, after you press the button, it should take you to your new cut clip. Don’t worry, it doesn’t make your original clip disappear. All it did was make another version of your first clip. If you want to change the cut you made, you can still access your old clip from wherever it was saved to make changes. Lastly, with your cut clip, you can input it into the stitching software you use and it shouldn’t take as long to stitch compared to stitching your original raw footage. Once stitched, you can repeat the same process to all your videos. Once, you’ve cut all your desired clips, you can input them into your Adobe Premiere project for further editing of your video. A pro with his feature was that I found it extremely helpful while editing because it did make the editing process go by faster. When stitching raw footage, it takes quite a few minutes to process, especially if your video is a few minutes long. However, after using the trim tool, it shortened my desired clip and it made stitching a lot faster than would’ve been with my original clip. One con I did notice with the tool was that after trimming multiple clips, it does become annoying to constantly drag the timeline to your desired spot versus using the cut tool in Adobe Premiere. However, it was not a complete game changer to not use this tool. One tip I would say to keep in mind with this tool is after you cut your clip, pay attention to the clips name and where it will be saved. It is easy to lose your clips on your laptop or desktop if you don’t know where it is being saved. With that said, I suggest you click on the “file” tab. Clicking on it will allow you the rename your clip to a name that is easy to navigate. You do so by clicking on the “save” option and it’ll take you to a window where you rename the clip while also give you the option to save it where you want. Overall, discovering this tool made editing a lot faster than it would’ve been using my original clips. Inputting a cut clip into the stitching software made the the process so much faster and it’ll make editing in Adobe Premiere easier. I highly recommend using this tool for anyone creating 360 videos, but I especially recommend it for people who are beginners at VR or beginners at Adobe Premiere. If you want to watch a video version of how to use the “trim” tool, select the video below. On October 25th, Alaina Kwan experience her first ever haunted maze. Alaina never liked anything scary or horror related, so this was a huge step for her. She decided to try and conquer her fears at Wicked World by going through their clown trail. It was not what she expected and her experience took a turn for the worst. Jericho Curry was the photographer. Alaina Kwan was the editor. 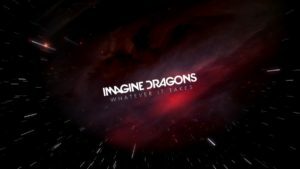 Last fall the band, Imagine Dragons, released a 360 music video of their hit song, “Whatever It Takes,” and it has received over four million views on Youtube. The video is the lyric version of the song and it takes place in another geometric dimension. The video was produced by RMV Productions and created by Peter Reeve. Their inspiration for the psychedelic video came from the band’s graphics they had already created for their album, “Evolve”. The music video can be enjoyed by viewers of all ages, and I considered the video successful due to its superb quality and how the video was very interactive with the viewer. Plus, considering the 360 music video received over four million views, I would say the general public believed it was successful as well. Imagine Dragons had also created other 360 music videos for their song, “Believer,” which received 120,000 views and their other song, “Shots”, which received over two million views on Youtube. 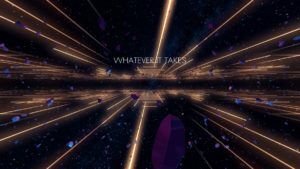 I viewed the, “Whatever It Takes,” 360 music video in 4K. 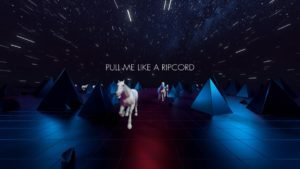 The animated 360 music video was the lyric version of the song, and the lyrics to the song were listed sporadically throughout the music video, in order to guide the viewer where to look. In the beginning, the viewer starts in a black space, as if it were space. White lights that look like stars come shooting through until the ground rose into blue geometric shapes moving in such a way to make the viewer feeling like they are flying forwards or backwards.The setting of the video almost seemed like it took place in some kind of cosmic reality which just so happened to resemble the artwork of the band’s album cover. The video then becomes interactive when the song begins, because the lyrics started to pop up throughout different parts of the video in order to navigate the viewer through the whole experience. The neat thing about this 360 experience was that no matter where the viewer looked, the setting stayed the same. However, if the viewer turned around the setting adjusted to the viewers perspective. For example, the viewer starts looking forward and seeing the lyrics right in front of them, but once they turn around their the words flip also in order to pertain to the viewers perspective. There was not a specific storyline, but it gave a very unique and interactive experience to the viewer, while transporting them to a different dimension. There was not a cast of characters, or main characters for that matter. The viewer is immersed into the cosmic dimension alone, and remain alone throughout the whole experience. Even though the viewer remains alone, the video was still perfect for VR because the interactiveness of the lyrics and the movement of the video makes the viewer experience every part of the setting and make it really feel like you are in this trip reality. The only weakness I found throughout the video was that there was no storyline. The viewer starts in the dimension and finishes exactly where they started. The lyrics of the song suggest there would be a motivating story throughout the experience, but that unfortunately never came about. It was cool to feel like I was in this cosmic reality, but that main theme stayed constant throughout the whole video, and for some it may eventually become boring and lack emotion from the viewer. 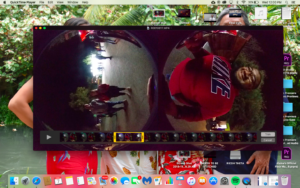 However, I still believe the music video was successful for VR and it allowed the viewers to enter an alternate reality while also learning the words to the song in a fun and interactive way. The different locations of the lyrics helped maintain my interest by being able to view every part of the video. It was never specified if the music video was to advertise anything, but I do believe it was made to help viewers spark interest in the band’s album and purchase their soundtrack. In conclusion, the 360 music video was successful, but maybe if a storyline was involved it would improve the music video’s experience and draw even more emotion out of the viewers.